Starting on tomorrow, the first of October (Can’t believe it is already here! 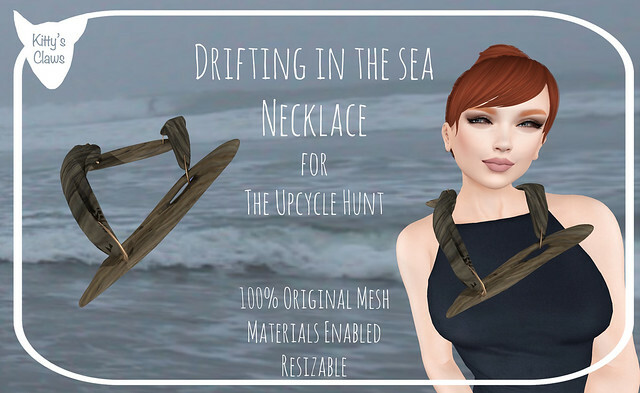 ), The Upcyclers Hunt starts and I have a necklace made out of driftwood. The hunt runs until the 31st and is in my mainstore location. As usual, it is 100% original mesh that is materials enabled and resizable. After the event, the necklace will go up on the Marketplace for a yet to be determined price. In other news, I have put the Love is a Battlefield Gacha in-store. Since a lot of people really liked my gift (the bracelet), I am putting it up on the Marketplace starting today and running to the end of the month. Previous: Previous post: Kitty’s Claws: Love is a Battlefield Gacha @ Jackpot Gacha Event!